Whether you are hitting the slopes for a fun winter weekend or heading to the beach for some much-needed sun, taking care of your hearing aid is crucial for both your health and your comfort on the road. For many families, January and February are months of travel and winter vacations. 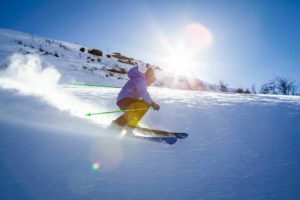 Whether you are hitting the slopes for a fun winter weekend or heading to the beach for some much-needed sun, taking care of your hearing aid is crucial for both your health and your comfort on the road. If the upcoming weeks have a trip in your plans, consider these four essential tips for traveling with your hearing aid this winter. One of the most crucial considerations for your hearing aid is to keep it dry and safely stored when it is not in use. This is especially important for vacations that involve skiing, swimming, or exposure to any kind of moisture during the day. A designated dry aid kit provided by your audiologist will allow you to safely store your hearing aid during any vacation adventure so that it is well-protected and ready to use when you need it next. Cleaning your hearing aid is essential to your health and comfort each day. With this in mind, be sure to bring along your hearing aid cleaning tools for your winter vacation. As you are packing your cleaning tools, it is best to keep them inside of your carry-on for any unforeseen delays in which you may need them. Many hearing aids can continue to be used during a flight, even those that are Bluetooth. If you are uncertain about the capabilities of your hearing aid, be sure to research your hearing aid type or contact the airline prior to your trip so that you are well-prepared for your upcoming flight. Don’t let a dead hearing aid battery ruin your winter vacation! Instead, pack along extra batteries just in case you may need them during your trip. It is also wise to keep extra batteries on hand out of convenience, so that you are not searching for the right battery in an unfamiliar place on your vacation.